Buzzword is Adobe's online, Flash-based word processor. 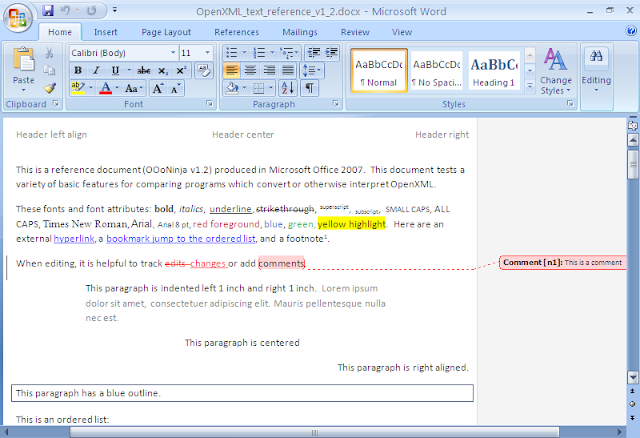 Among the formats it supports is Microsoft Office Word 2007 (.docx), a thorn for many OpenOffice.org users, but how well does Buzzword convert .docx files for use with OpenOffice.org? Buzzword successfully imported all the basics well: text, character properties (including bold, italics, underline, strikethrough, typefaces, size, and color), the link, bullets, ordered list structure, table, header, and footer. However, many elements were lost in the translation: superscript, subscript, small caps, all caps, header spacing, track changes, comment, paragraph outline, columns, the embedded image, math equations, and the embedded Excel 2007 document. The footnote was converted into plain text. The fonts were converted into unusual fonts (see note below). I noticed several quirks unique to Adobe Buzzword and distinct from OpenOffice.org or Google Docs. Buzzwords supports neither my browser (Firefox 3 beta) nor my platform (Linux). Despite the Adobe brand, does not save as PDF because it was recently bought from Virtual Ubiquity. Buzzword only supports a few, unusual fonts: Adobe Garamond Pro, Courier Std, Cronos Pro, Minion Pro, Myriad Pro, New Gothic Std, Tekton Pro. Buzzword is based on Adobe Flash, which does not integrate well into browsers: Flash bypasses the Firefox password storage system, and when the focus is in a Flash control, Firefox shortcuts are disabled. Buzzword prints as an image, so creating a PDF by printing from a supported browser to PDFCreator creates a bloated, unsearchable PDF. 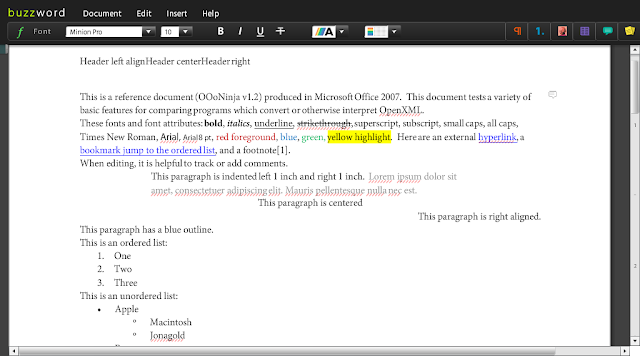 Buzzword is capable of basic formatting but, given its quirks, that it does not integrate with OpenOffice.org, and the other .docx converter options, Buzzword is not a first choice right now. Because Buzzword has just implemented the .docx feature five weeks ago and their engineers are soliciting feedback, Buzzword's .docx support is poised to improve.